The Artists: (Above) Joey P. and RamBro have countless hit records by Grammy-winning artists on their resume, and they’re not shy about how much they love working with soft synth workstations Reason and Project5. When Reason first appeared on the scene, it was pretty amazing. All those soft synths and samples – plus processors, patch cords, and a sequencer, all in one application. Don’t even get me started on how cool the retro Roland-style drum machine is! I still remember the night my “Dynamic Duo” partner, Dale “RamBro” Ramsey, and I first loaded the software and explored feature after feature. But it doesn’t do quite enough for me, so I got serious about using Cakewalk’s Project5 on my PC laptop. Its totally open system supports plug-ins, reads ACIDized file formats, allows recording digital audio, and supports various ways to record from pattern-oriented MIDI, to linear digital audio, to live jamming and experimentation with the groove matrix. Plus, Project5’s ability to manipulate acid files allows me to use all my favorite grooves from Smart Loops, like the indispensable Dry Studio Kit. However, since I’d developed a lot of sounds for Reason over the years, I wasn’t ready to just throw all those resources down the drain. Luckily, I didn’t have to, because the engineers at Propellerhead added one very cool feature designed to let Reason play well with others: ReWire. This is basically a protocol that lets me route outputs from one program into the mixer of another program. So, for example, I can “ReWire” Reason into Project5’s mixer, which lets me use the two together as one cohesive, synergistic program. Ed: ReWire is a technology developed by the Props for Reason; it’s supported by many other apps including, on Windows, Cakewalk SONAR, Ableton Live, Cycling ’74 Max/MSP, FL Studio, and others. When you add Reason’s roster of instruments to Project5’s collection — like Dimension (which has become my go-to instrument for most projects) and Cyclone DXi2, you have a real powerhouse. Want to really get into the groove? Take a tip from RamBro and MIDI-up your Akai MPC or M-Audio’s Trigger Finger and access the “virtual pads” with your hardware controller. 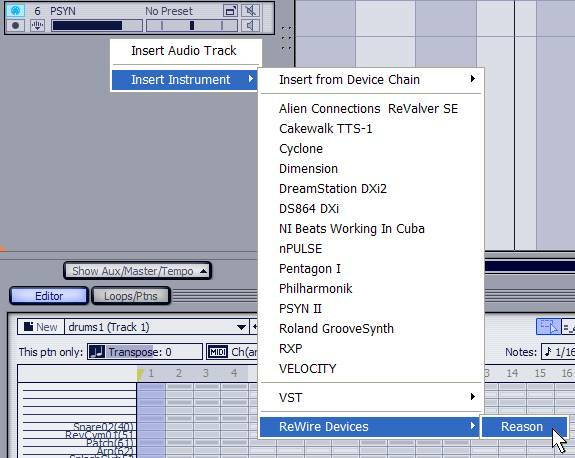 If you’re new to ReWire, there’s some great background info authored by music-tech guru Craig Anderton at Cakewalk.com. This explains the protocol basics and gives a little history of how ReWire works. But let’s get specific about using Project5 and Reason; it’s not hard, and the results are worth it. First, open Project5. This is called the “ReWire host,” because it will “host” Reason as a “client.” (Note that Project5 can serve as a ReWire host or client.) Then right-click on an empty space in the Tracks pane, and select Insert Instruments > ReWire Devices > Reason (Fig. 1). A track opens up for Reason, but you still need to open up Reason. To do this, click on the Reason track’s “Show Instrument” button (Fig. 2) [in Project5]. Reason opens up. Figure 1: Add Reason to your Project5 project by right-clicking an empty part of Project5’s Tracks pane. This creates a track for Reason as a ReWire client. Figure 2: Open Reason from P5 using the Show Instrument button. Now, Project5 isn’t just a host, it’s the perfect host: It wants to handle all of Reason’s audio and MIDI responsibilities, and you should let it! In Reason 3.0, go Edit > Preferences. Select the Control Surfaces and Keyboards page, and if anything says “Use with Reason,” uncheck it. On the Advanced MIDI page, have all fields show “No MIDI Input” (Fig. 3). Meanwhile, in P5 under Options > MIDI Devices, select the appropriate MIDI device — the one that’s listening to your keyboard’s MIDI out signal. Figure 3: You’ll be routing MIDI via Project5, so configure Reason to ignore MIDI input from your external devices. If you don’t have an instrument, mixer, etc. loaded into Reason, do so now. It’s easy to send MIDI data to Reason: Open Project5’s Inspector for the Reason track, and look under MIDI Input. In the MIDI “Send to” field, you’ll see all the devices loaded into Reason (Fig. 4). 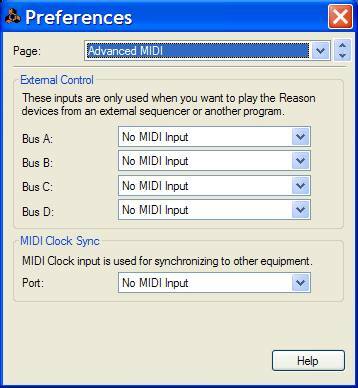 Select the one that should receive the MIDI data; you can switch around among the various instruments and play them. Figure 4: Route MIDI data from Project5 to Reason by configuring P5’s handy “Send to” MIDI field on the Reason track. 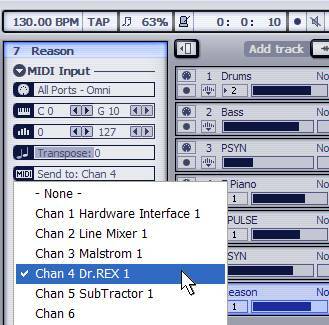 If you want to use several Reason instruments, note that you can’t create individual MIDI tracks in Project5 for each Reason instrument; all MIDI data feeds the single “send to” Reason track. No problem: just offload a track from Project5 to Reason’s sequencer. Under ReWire, the two sequencers sync up, start, and stop together, and recognize any loop point changes in either Project5 or Reason. This is great, because I prefer to create in Project5’s MIDI environment rather than Reason’s, which is less efficient. So, what I do is send the Project5 track MIDI out to a Reason instrument, and start recording in the Clips pane to create a Pattern. Of course, during this time, I’ll be hearing the Reason instrument. I’ll then edit the part in the Pattern editor until it’s just the way I want, and save it (just in case I need to come back to it later). Transferring the pattern to Reason is simple. 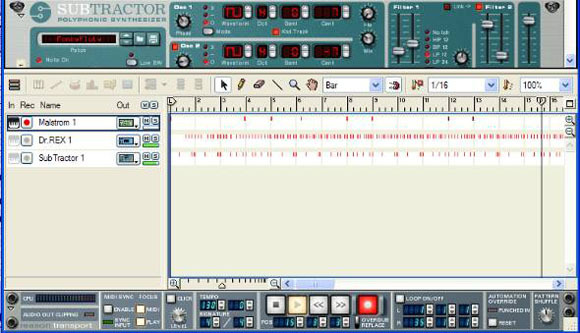 In Reason’s sequencer, click on the Record button and keyboard icon for the track containing the instrument that should play back the pattern. Make sure Project5 is sending its track to the right Reason instrument. 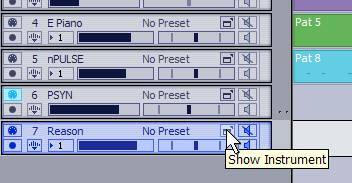 At Reason, “rewind” to where you want to begin recording, click on Reason’s record button, then click on Play. P5 will start playing back the sequence, and Reason will start recording it into the designated track. Fig. 5 shows three tracks recorded into Reason from Project5: The Dr. REX and Subtractor parts were recorded first; currently the Malstrom part is being recorded. Note the little red “ticks” in the sequencer, which indicate the presence of MIDI data. Figure 5: MIDI data is recorded into your Reason file, from Project5 (thanks to your MIDI routing configuration in P5). By the way, from time to time ReWire will get temperamental and won’t record the data coming from Project5. Don’t worry. Just save your Reason setup and Project5 project, close Reason, close Project5, then reopen Project5 and call up Reason. This is like rebooting your computer, and things should work properly again. Here’s another way to use Project5 and Reason. So far we’ve assumed you’ve done most of your work in Project5, and want to add instrument sounds in Reason. But what about the reverse: you have a tune you wrote in Reason, and want to add vocals or ACIDized loops? This is where Project5 fills in Reason’s gaps: As you play back the Reason project, go ahead and record digital audio in Project5, load loops into the GrooveMatrix, play Project5 instruments, and you’ll have the best of both worlds. Now you can have the ultimate system all in one place. All the sounds and samples you need, plus a fully-professional recording studio. With a set-up like this, I can plug my MXL V-69 condenser mic into a Toft Audio Designs ATC-2 pre-amp/compressor and make a record that rivals anything I’ve ever done on a large-format SSL in a major studio. That’s power! Even though ReWire itself doesn’t stress out your computer, if you have a slower or older system, running two sophisticated digital audio programs at the same time may push your machine to the limit. If this happens, remember to use Project5’s Freeze and Bounce functions. Either one can convert the Reason sounds into a digital audio track, which means you can close Reason and not have it load down your computer’s CPU anymore (a digital audio track puts a much gentler hit on your CPU then a software synthesizer). Ed: Just to clarify — keep in mind that, thanks to ReWire, Reason can use Project5’s resources for the tasks normally associated with hosting. You’ll still eat up computing power by running instruments and effects in Reason, though, so Joey P’s advice is important, especially if you’re planning to use your setup to play live. I will say that since making music with Project5 version 2, Reason doesn’t get quite as much exercise as it used to. But it still makes a great synth rack, and when you couple it with the Project5’s instruments, it seems there’s really no limit to what you can do. 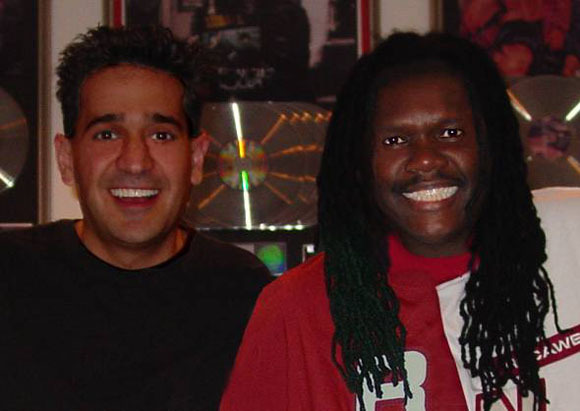 Hitmaker Joey P. and his partner Dale “RamBro” Ramsey (“The Dynamic Duo”) have worked with a wide array of Grammy winning artists from the worlds of Pop, R&B, Rock, Rap, and Jazz, with numerous Top 10 and #1’s. The records they have worked on have sold over 75 million copies. Learn more at www.JoeyP.com and www.DaleRamsey.com.